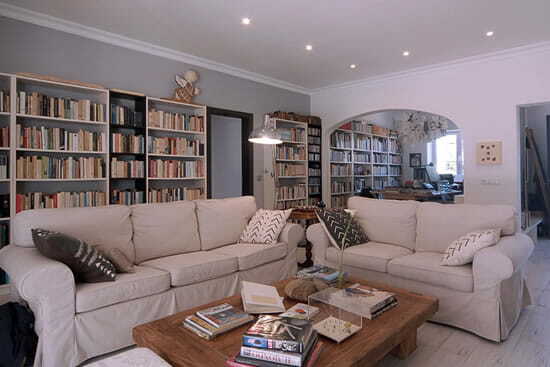 Do you dream of a charming Guest House in Menorca? A villa with swimming pool to feel at home in and live a dream holiday in the heart of the Mediterranean. 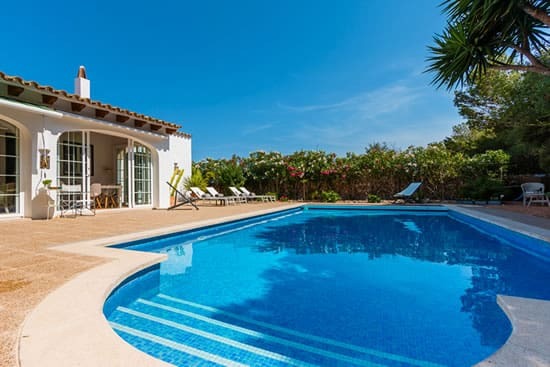 Book your B&B in Menorca: welcome to Casa Bonita! An hotel in Menorca? Even better! A white house in the Mediterranean country setting of Trebaluger, among wild olive trees, rhododendrons, hibiscus and palms. 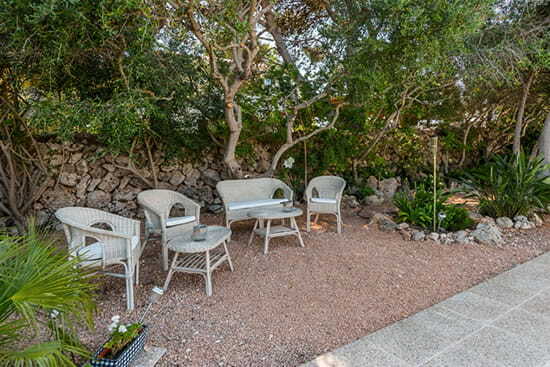 An oasis of peace even in August, 10 minutes from Mahon, 5 from Sant Lluis and Es Castell. 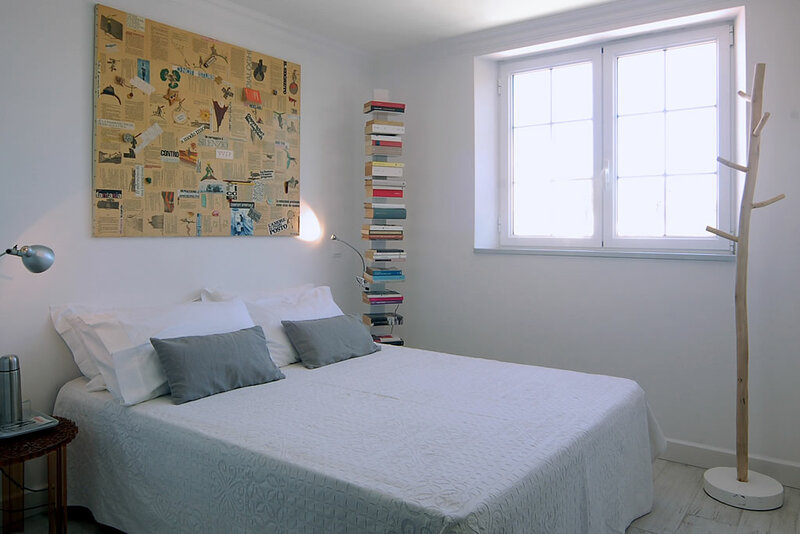 A charming holiday home with 3 guest rooms, all with private bathrooms, elegant spaces and an environment where you can taste, enjoy hospitality Made in Italy. Where everything has one purpose: to make you feel good! Einstein, Confucio and Picasso are the three guest rooms in Casa Bonita. All different, each with private bathroom en suite, and have quotations on mirrors and walls by the author after which the room has been named. Two territories in one: bizarre inlets and indented coastlines to the north carved by the tramontana wind; gentle coves and pine forests crossed by streams to the south. 240 kilometres from Barcelona and 380 from the African coast. 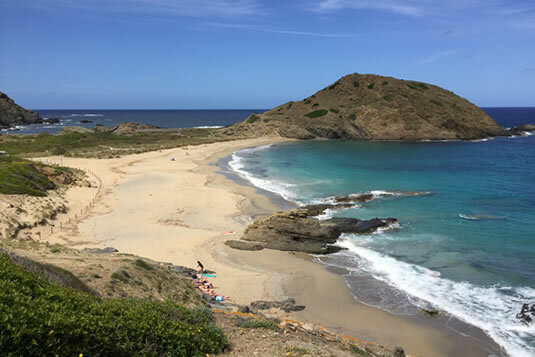 Minorca has the best preserved natural landscapes in the Mediterranean: it is home to a nature park, five nature reserves, a marine reserve and 19 nature areas of special interest. Cala’n Turqueta is an example of island ecology. It continues to be an authentic natural paradise thanks to the commitment of its inhabitants. Minorcans, in fact, protect and preserve the beauty of ancient ruins, white villages, forests, gorges and 134 bays and coves. It has a unique variety of flora and fauna: in La Albufera d’es Es Grau alone there are eleven thousand water birds of almost a hundred different species. The title “Unesco Biosphere Reserve” is a responsibility. A white villa on one floor, shades of green and red, protected by ancient stone walls: listen to the sounds of relaxation and silence! Not only a room with breakfast but also a swimming pool with sun beds and outdoor shower, garden with hammocks and loungers, lounge and veranda: everything is organized to welcome you and offer you experiences and wellness. «Thank you for this corner where everything is harmonious and simple, full of exchange and welcome». «Excellent hospitality, kindness, friendliness: this is the essence of Casa Bonita». «It was more than just a vacation, it was a life experience. I'll take the "little by little or poc a poc" with me!». «What a wonderful place, Casa Bonita, for our honeymoon!». «Thank you for smiling in the morning and and the "hug" day after day. A magical home on a magical island. A home where everything is "there" but leaves you the space to be».